Before and After: White, Yellow, & Brown hair to all one Platinum tone! Going platinum blonde is different story for everyone. It all depends on your starting hair color, and how quickly your hair takes to dye. The first initial bleach takes hours. 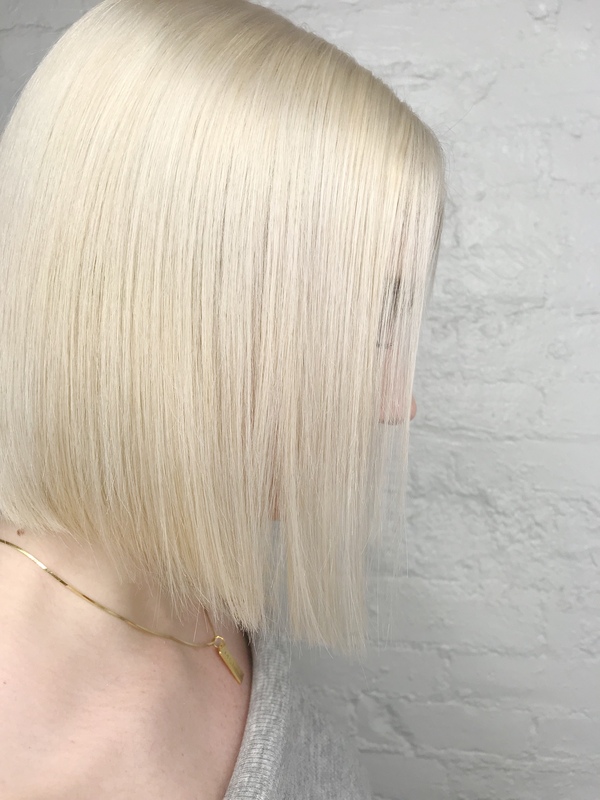 For some hair types it can take up to three bleaching treatments to finally get that white blonde look. The first time I went to get my hair bleached, I found a Groupon and went to a salon in up-state New York. This was because it was going to be considered a triple process color with doing my roots, and then the full bleaching. It was a journey, but worth it in the end to save some money. The second time around I went to Sally’s Beauty Supply and purchased L’Oreal Quick Blue, developer, and toner. My hair turned out perfectly! So the third time around I decided to to try just doing my roots at home with the Quick Blue again. Well this time it turned out that something with the toner did not mix correctly, and turned my hair YELLOW. Once it goes yellow there really is not going back in an easy way. Although google may tell you otherwise, I decided that it was time to take it to a professional. I was googling places in Brooklyn that did hair, (because when I was checking a handful of places that fellow bloggers had suggested on Instagram woooo they were pricey). Shampoo Avenue B in the LES came up, and the prices did not look bad. I first went in for a consultation. This was because just sending in a photo isn’t clear enough to estimate which specialist would do my hair due to the fact that I was thinking of going silvery blonde. I then waited about 2 weeks to go in for the actual coloring with Akasha. I was so nervous thinking that there was a chance my hair would not all be one solid color, or the fact that it can always go a little blue or purple when bleaching. The final results were amazing! I loved the wine they offer you in the beginning, the chandeliers in the shampoo area, and great associates. The price for a cut, double process color, and blow dry was $275.00 which is a steal!